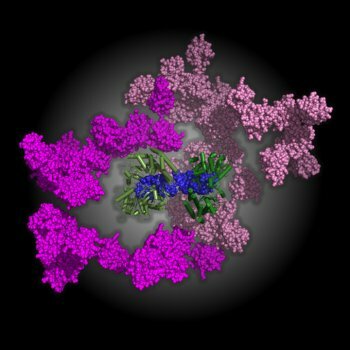 A synchrotron technique has enabled researchers to achieve new structural insights into an important process at the frontline of our cellular defences against viral pathogens. The Australian and German collaborators were investigating a family of receptors, called the retinoic acid inducible gene-I (RIG-I)-like family, that detect and bind to foreign double-stranded ribonucleic acid (RNA), such as viral genetic material, in the cytoplasm. The binding process stimulates production of signalling molecules that disrupt viral replication and help alert surrounding cells to produce more RIG-I receptors in readiness to fight a viral invasion. The researchers used size-exclusion chromatography (to separate different-sized molecules) in combination with multi-angle light scattering (for determining molecular weight) and small angle x-ray scattering (SAXS) to construct the first model of the fully activated RIG-I. They found that when two molecules of RIG-I bind to a long enough section of double-stranded RNA, the molecular assembly that results becomes highly extended and flexible – and ready for the next step in the activation process. The length of the RNA appears to be important for stimulating an effective immune response. The new molecular model and accompanying insights show the value of SAXS, which enabled the researchers to examine conformational changes in solution that would not have been accessible by crystallography. The work has taken five years to achieve, and may lead to potential pharmaceutical applications. Simone A. Beckham, Jason Brouwer, Anna Roth, Die Wang, Anthony J. Sadler, Matthias John, Kerstin Jahn-Hofmann, Bryan R. G. Williams, Jacqueline A. Wilce and Matthew C. J. Wilce, Conformational rearrangements of RIG-I receptor on formation of a multiprotein:dsRNA assembly, Nucleic Acids Research, 41, No.5, 3436-3445 (2013). A molecular model of the multiple conformations of full length RIG-I bound to double-stranded RNA 29mer derived from a number of combined SAXS data shows 2 RIG-I molecules binding to the dsRNA to adopt a fully active conformation. The C-terminal and helicase domains (green) bind to the RNA (blue) to form a hotdog-like conformation, while the caspase activation and recruitment domains (shown in two shades of pink) adopt a wide range of positions relative to the rest of the complex, permitting interaction with downstream binding partners. Image: Matthew Wilce, Monash University.